Best and easiest butter chicken pizza ever, and an excellent way to use up your leftover Two Sleevers butter chicken or the extra butter chicken sauce-if you ever have any left, that is. 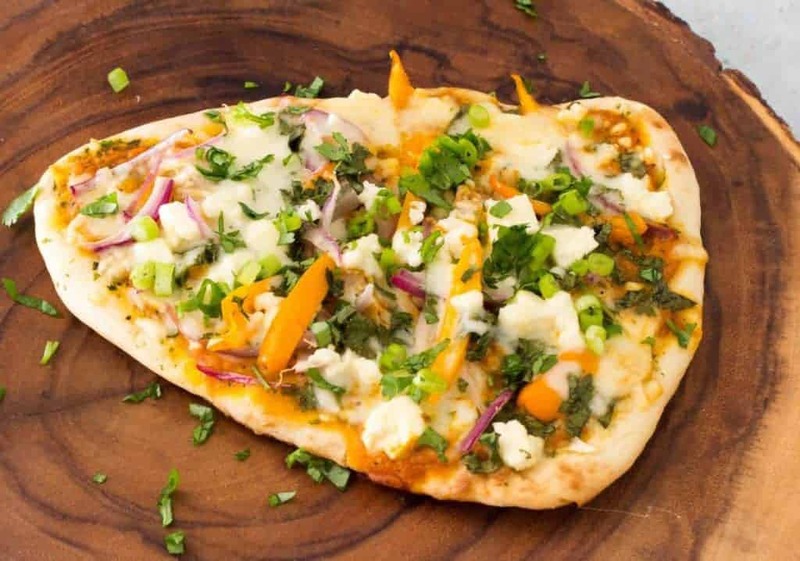 Use ready-made naan to make pizza night even easier. Ever wondered how to use up that extra butter chicken sauce you’ve got from making Now and Later butter chicken? Although I’ve provided lots of ideas in the FAQs and in my best-selling cookbook Indian Instant Pot Cookbook on how to use it up. 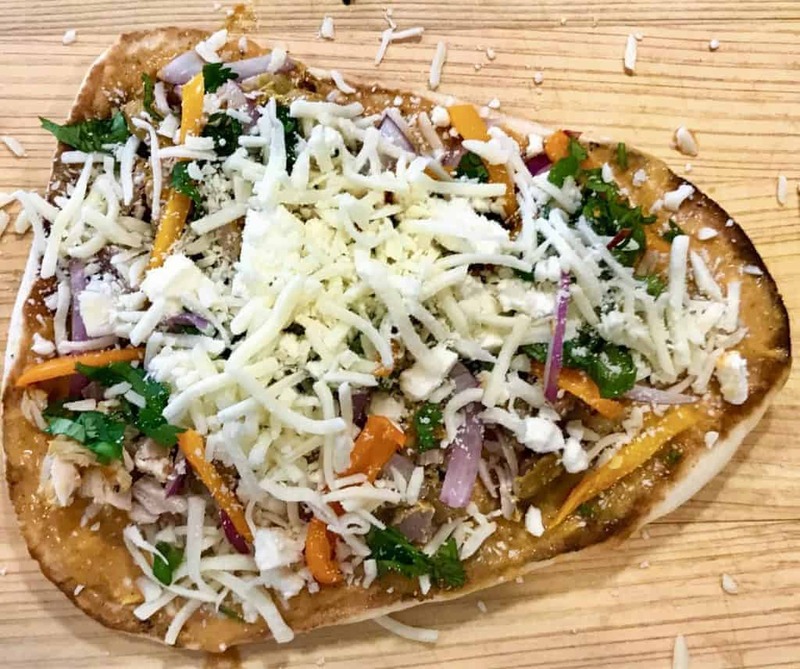 But the other day, Jen who has a wonderful “how to fail at cooking but also sometimes succeed blog” posted about a place near her house that did Butter chicken Pizza—and all of us got WAY too excited. So I set about trying to make Butter Chicken Pizza. I had to make it twice because my first version was good but not excellent. The second time around I changed a few things. Moved away from refrigerated pizza dough and used Trader Joe’s ready-made frozen naans. I tried both the plain and the garlic naan, and the garlic one was so much better! If you can, get that one. If not, a plain, ready-made naan is also very good. Added a little Sriracha to the butter chicken sauce. Honestly, that made a huge difference. Previously it was good—but it wasn’t dynamite. This one was dynamite—at least according to Roger and me. I’m curious to see what you think of it. Made it in the oven and in my Instant Pot gem. Both work well, the only difference is that in the oven you can broil the topping for the last few minutes, which you can’t in the GEM, but honestly they both tasted equally good to me. 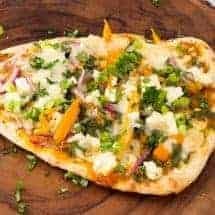 I am very sure that another thing that will elevate this Butter Chicken Pizza, is the addition of a few dollops of this green chutney to the sauce. I just didn’t feel up to making it. I’m in FaceBook jail for a few days and it’s gotten me down, to be honest. I need to snap out of it. 2 frozen pre-cooked garlic naans or use plain. I used Trader Joe's naans. Press BAKE, set the temperature to 400F, and allow your Gem to preheat. Cut a piece of parchment paper to fit inside the Gem. You will use this as a sling to get the pizza in and out of the Gem. Set this paper aside for now. While it heats, start assembling your pizzas. Mix the sriracha sauce into the butter chicken sauce. Spread toppings in this order: Sauce, a little mozzarella, chicken, onions, peppers, feta, rest of the mozzarella, and finally, cilantro. Place the two naans on the parchment paper and place carefully into the hot Gem. Set the timer for 15 minutes and allow them to cook. When the cheese has melted, they are ready to pull out and enjoy! Place the two naans on a baking pan or preheated pizza stone, and place into the oven. Set the timer for 10 minutes and allow them to cook. If you like, you can broil for 2-3 minutes for a crisper cheese finish. When the cheese has melted, they are ready to pull out and enjoy! Please do not trust my calories on this! I don't know how to calculate the macros for this given it uses leftovers from a previous recipe, and iI don't know how thick/big your naan is. I had this for dinner on the weekend and really enjoyed it! I love pizza but due to dietary limitations, tomatoes are now a treat vs a staple and the sauce on pizza really causes me havoc. So this was a great substitution. I enjoyed it so much, I had it two nights in a row!! I also picked up your Indian IP Cookbook this weekend and am looking forward to trying a number of recipes in there. I didn’t think that Naan was approved from Keto???? 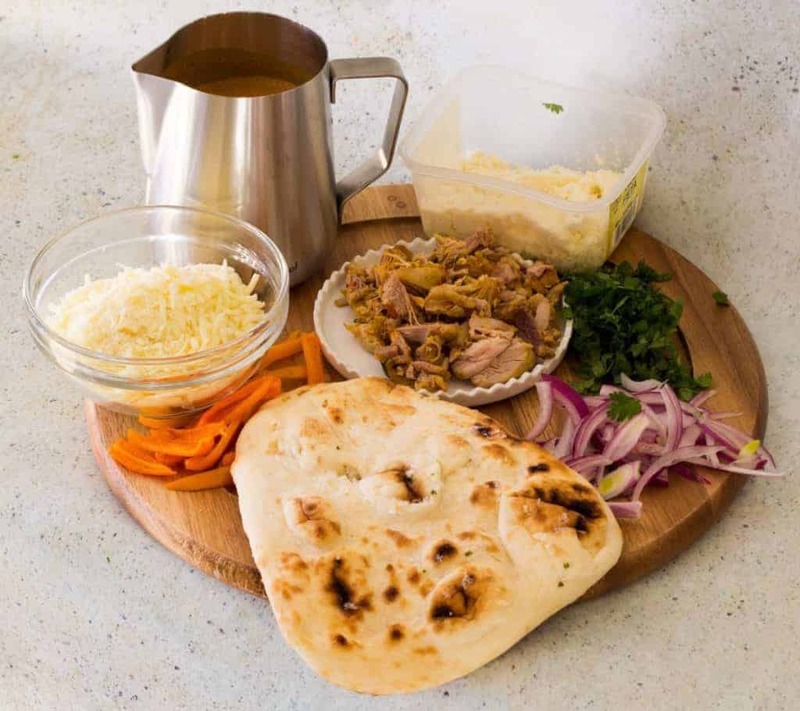 This isn’t marked as a Keto recipe because you’re right naan is most decidedly not Keto. However. I’m about to try this with low carb lavash. My world is now complete. 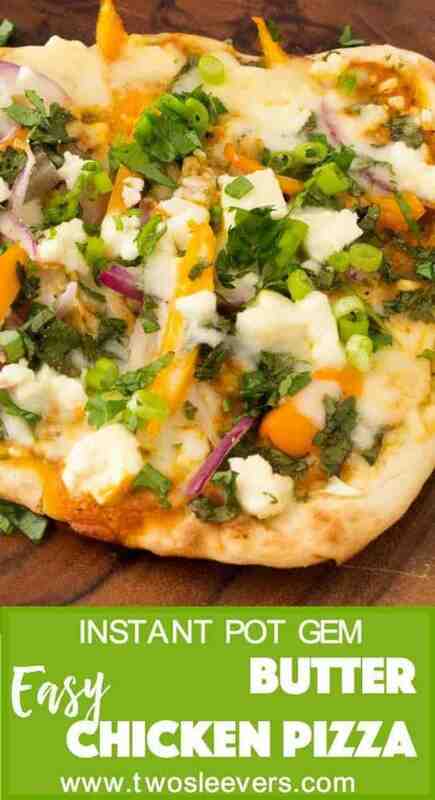 The sriracha and feta were next-level genius! I made one tonight and gobbled it all up. Yay!! So glad to hear that!